Over half the parking spots at Niles Beach were occupied by vehicles WITHOUT PARKING STICKERS. 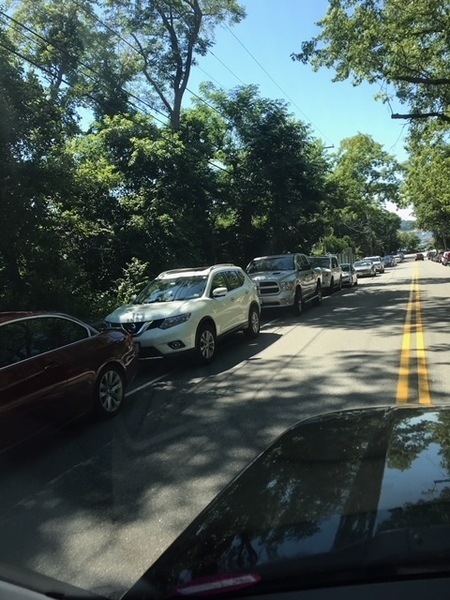 at 12:00 on tues 7/3.As there is no enforcement of the law as described by the signage, people always park there anyway as there is never any fear of repercussions. Why should anybody pay 20 bucks for a sticker when law enforcement obviously considers it a joke and does nothing to enforce the law like maybe tickets like us residents get when we go to virgilios for a sandwich and our meter which are unreadable in the winter goes over by 1 minute and there is someone just waiting to give you a ticket??? yeah maybe enforce beach parking against non residents with the same enthusiasm you exert against actual resident taxpayers otherwise!!! And, yes, people that have not invested in beach stickers park everywhere. I witnessed a whole bunch of cars parked out behind CVS on Thatcher Rd. with families of passengers walking toward the beach carrying their gear. No parking fees, no tickets, no towing. the cars were ticketed, but, they still took 12 precious parking spaces from residents ALL day.. I suspect at least some of them knew they would be ticketed, but, felt it worth the $50.00 spend the day on Niles Beach...they should have been towed. There are three concrete panels that need to be replaced. Resident states they have heaved. the storm drain in front of 10 rocky neck is filled to the top with sand and dirt - floods when it rains. Could you please clear it? There are no crosswalks delineated for the dangerous intersection at Poplar and Maplewood. This intersection needs to be addressed with crosswalks, traffic signals or signs, and a repaired sidewalk. I have witnessed far too many close calls between cars and pedestrians (kids on bikes especially). The entire length of Poplar St from the DPW to Russel Ave is crumbling. This is a heavily used side walk at a dangerous intersection. There is a school bus stop, a public transportation route and a walk way for children walking or riding their bikes to school. I am requesting the sidewalk be replaced and a crosswalk delineated at the intersections. I have witnessed far too many close calls with cars and pedestrians. At Richdale's right next to the mailbox there is a sink hole forming. The brush along the fences in the Palazola Playground is again out of control and is an eyesore and haven for rubbish and who knows what else. As an area used mainly by youth sports it should be cut back to eliminate the briers and any broken bottles and other rubbish. Thanks for your quick response. I truly appreciate anything you can do to make this happen. The cars parked on both sides of Farrington ave is getting out of hand, why is only one side resident only, or is parking even allowed on the other side? Niles is a very small beach and its getting overwealmed by all these additional people. This issue was recategorized from Police Department (Non-Emergency) to Street Sign Issue.